I've been feeling kind of bad that I don't have my fall decorating done yet. I'm into a whole lot of big projects and maybe, just maybe, I'm in over my head right now. My sister will be laughing because she says I always think I can do more than I can and wind up frustrating myself. Why did I start painting three rooms, yes three, when I have chicken coop winterizing to do and the yard to shut down? Better Homes & Gardens won't be beating down my door for a photo shoot, but it is real. I may not be able to show you my fabulous fall decor but who else can show you a chicken sleeping with a mermaid! Welcome to fall in Ontario! The chicken sleeping with the mermaid! Hilarious! And what a great harvest you had with the squash and they're all perfect! Utah does look pretty annoyed! Poor guy! 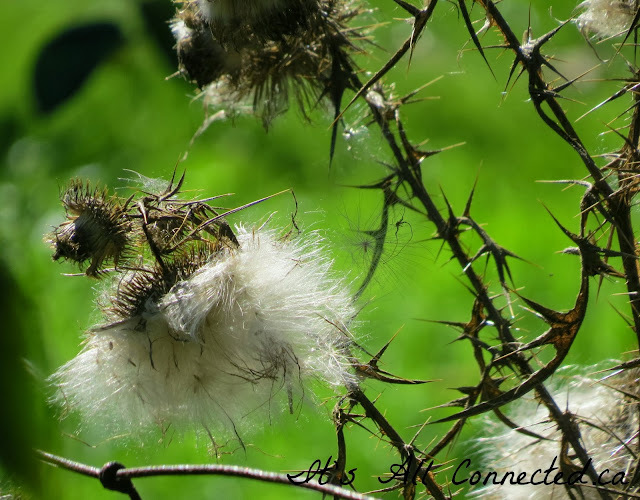 You are my fairy blog mother! I wished for 'Autumn in Ontario' and you fulfilled my wish! With the flick of your wand, I got to travel to my beloved province and visit with the gals and feast my eyes on your glorious fall bounty! Beautiful colours and composition, ready to be creatively cooked up in seasonal culinary delights! Just one more tiny wish: please let them be enjoyed first as pure eye candy, for all those lucky passersby! Ann is really a beautiful chicken. 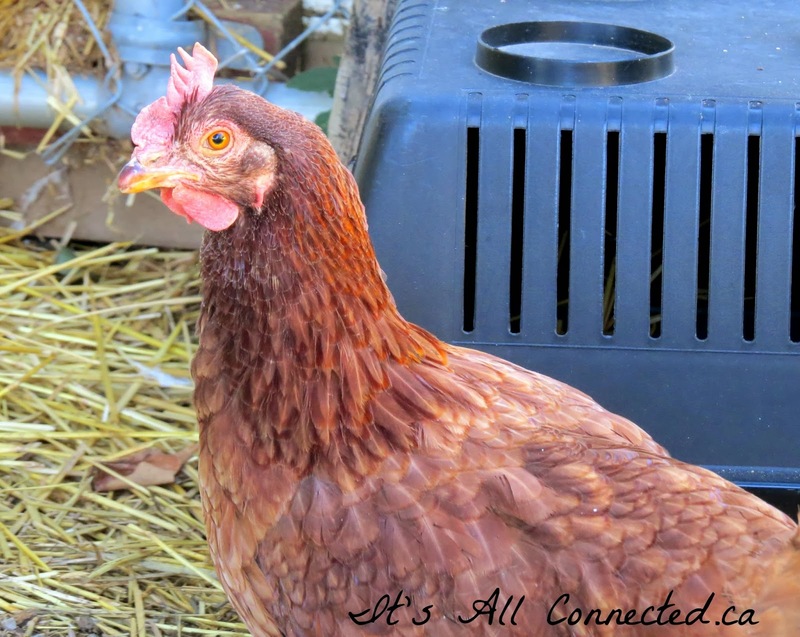 She has lovely markings or feathers. Your bounty makes for a very pretty natural fall display . . . something a designer would hope for! Great REAL post, Maureen! Give me REAL any day of the week. I haven't done a single thing to decorate for Fall yet- THIS is the weekend! I am commandeering the old truck for MY use this morning. What you have done there is a beautiful Fall vignette-all by itself-a REAL one! I think those are the best kind myself. Sure wish I could come visit you up there on your chicken ranch. I think we would talk for hours (while we painted rooms cuz I am not one to just SIT) and have a wonderful time. ps. 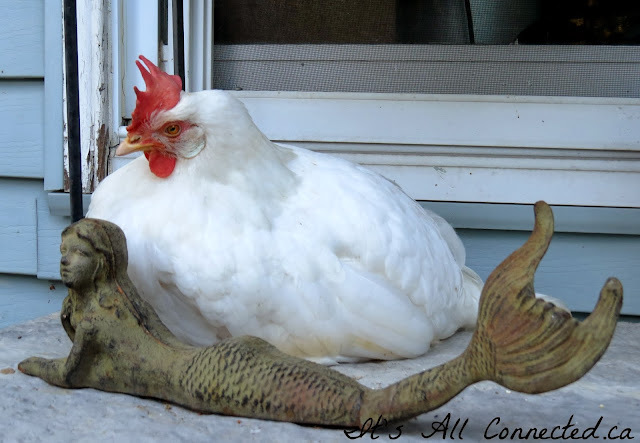 I have NEVER seen a chicken with a mermaid before! That doesn't happen often! I wonder how the chicken would do under the sea? Not very well I'm guessing. I love all the squash! They're gorgeous! What a lovely post. Loved seeing your front porch last year and even this year, I loved the squash, apples and the logs. It has such a warm and rustic feel. Those chickens are hilarious. Your names are so funny. And indeed, who has a chance to see a chicken laying with a mermaid :). A chicken sleeping with a mermaid! Love it Maureen! 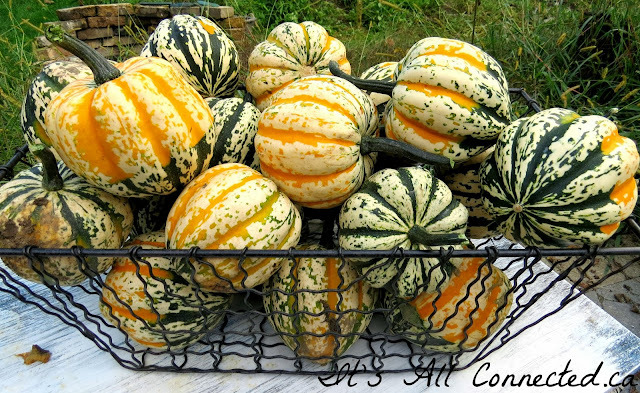 I love all of those beautiful squash and have a few like that myself for my favorite fall squash recipe. Yumm! I'd say that counts as a fall decor post for sure! Oh...and I was really surprised to learn about the skunks and eggs from your comment over at Amy's. Learn somethin new every day! I think better homes and gardens would like your decor it is real which makes it better, as usual your place has me dreaming of the country side I love the chickens 19 squash, score! I love self seeded pumpkin and squash they're always the best! Good morning Maureen ... That is a beautiful Fall decoration ... it is a keeper, but I know you will be doing something with those beautiful squash soon. Glad the chicks are starting to get along a little better. Beautiful pictures Maureen, I love the one of the chicken sitting down, Utah must be beside himself. 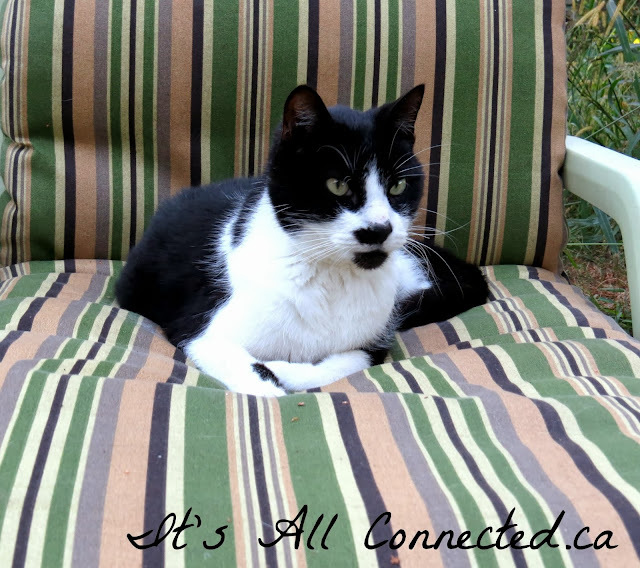 Your porch always looks nice and homey, love it. Nice post. 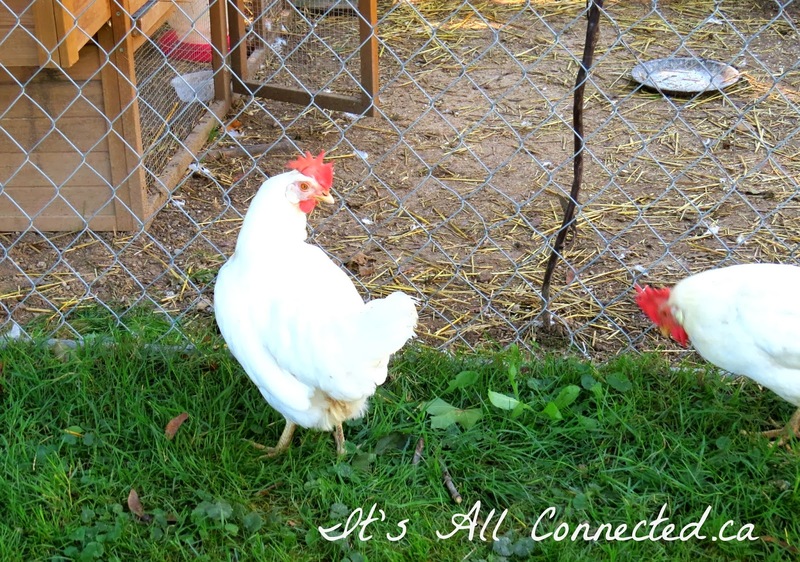 lovely photos, Maureen -- a chicken and a mermaid on a porch. love! Is it my imagination or does Ann Boleyn look better already ? I love the squash (they're unreal, like someone painted them) on the bench, it's the perfect Autumn décor. All your pictures are great, it's like each one tells a story, a very Maureen style story, that we all love to read. Both porch pics are great, but I'm really loving this year's because it's just so real and natural. Those squash look amazing! I know how cats feel about their special spots and Utah must have been exercising some uncatlike restraint to not have chased Gertie away. Luckily she was there long enough for you to take a snap. Priceless! Oh Ann looks like she is doing well! The shot with the mermaid and Gertie is priceless!! 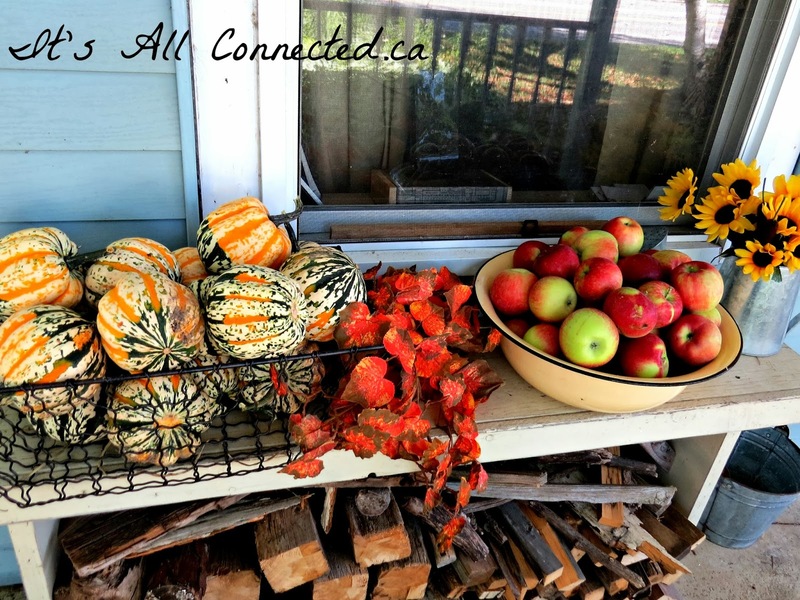 And, I think fall decorating is best done with all the natural elements around you! BEautiful shot. Sorry, I can't laugh about too many projects this time as I am in the same boat right now. Love the FREE squash. Can't wait to see who wins, Utah or Gertie, my money is on Gertie right now. I love your fall decorations and the hens. Eye treats. have a great week too. Haha... honestly, who else will show us a pic of a chicken sitting with at mermaid. 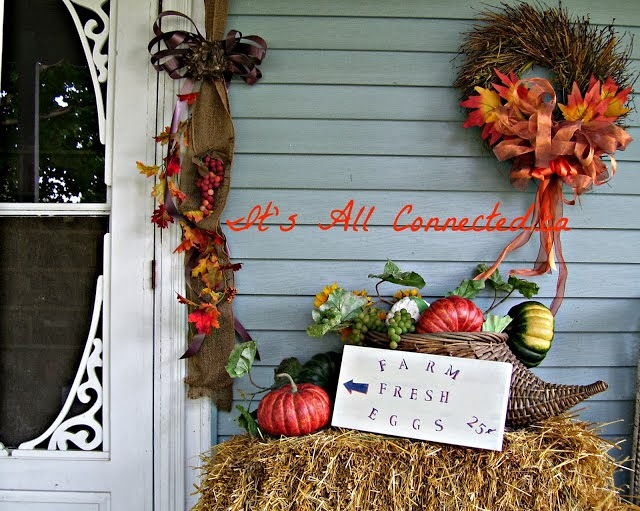 I think your porch looks decorated just the way it is, full of bounty. Ann Boleyn looks very regal! I only put out our pumpkin decorations so far, so don't feel bad about not having all your autumn decorating done yet! Personally, I'm sort of bored with the whole fall decor thing.....your chicken and mermaid are much more entertaining! What a beautiful set of photos! I love the squash and apples on the bench, and the chicken with mermaid, and the last one.. well, I love 'em all! Cute post! So much fun to see what you are up to! Wonderful produce!